If you use a machine to perform a task, at some point that machine will fail. For manufacturers this is a fact of life, as it is for the people who build and maintain our roads and railways, bridges and tunnels. For many years maintenance was considered to be a cost – a ‘necessary evil’ – but we now understand that by delivering maximum performance and minimising risk, companies can create value and achieve significant competitive advantage through effective maintenance. The Asset Management Group is researching new ways to help companies achieve this, working closely with a number of multinationals such as Hitachi, Exxon Mobil, and BT. It is also a key partner in the Cambridge Centre for Smart Infrastructure and Construction. If machines can report their ‘status’ into a common data-sharing platform – or social network – it becomes possible to create a single view of how the whole factory is running. In the early days of factories, standard practice was to wait until a machine failed and then fix it. But people soon began to realise that when a machine fails unexpectedly, it has all sorts of consequences: production is disrupted, quality is affected, delivery is delayed resulting in unhappy customers who take their business elsewhere. Preventive maintenance seemed to be the answer: anticipating failure and take pre-emptive steps to avoid it by replacing certain parts at fixed intervals and following a regular maintenance programme. This seemed like a good plan, based on the assumption that it should cost less than dealing with unforeseen failures. However, if a part is changed at regular intervals it is inevitably replaced more frequently than necessary because the process depends on erring on the side of caution. Recognising the additional costs they were incurring, and particularly with the advances in sensor technology, many companies moved to ‘condition-based’ maintenance based on continuous monitoring where parts are only replaced as required. So managing maintenance has become much more sophisticated over the years. But it is still only one part of what we call asset management. Procuring the right machine, installing it, training people to use it properly, maintaining it well, operating it in the right way and managing its end-of-life replacement – all of these elements are integral to making sure each asset delivers value throughout its whole life. An asset management system is, therefore, not just an IT system, as is sometimes thought. It is as much about the kinds of people, knowledge and skills an organisation needs and its ability to effectively extract value from its assets throughout their life. To address these connected issues we cluster our research questions into three strands. At the highest level, we look at how you develop a strategic asset management system which encompasses all those different elements and how you measure the performance of your system once you have put it in place. The second strand dives deeper into the technical aspects. What data are you collecting about your assets and how do you turn that data into information and then into effective decisions? What kind of decision-making models do you need in order to optimise your condition-based maintenance policy or to assess the amount of money you need to spend on the maintenance investments for your assets? Being able to access and interpret the right information is essential to getting a maximum return on investment. The third strand relates to the information itself. How do you ensure that it is of good quality and how do you develop a system which gets the right information to the right people at the right time? These three strands are brought together in this new area of research: how we capture and manage data, how we turn it into actions through algorithms and how, in turn, this will change the way in which businesses operate and their asset management systems are organised. 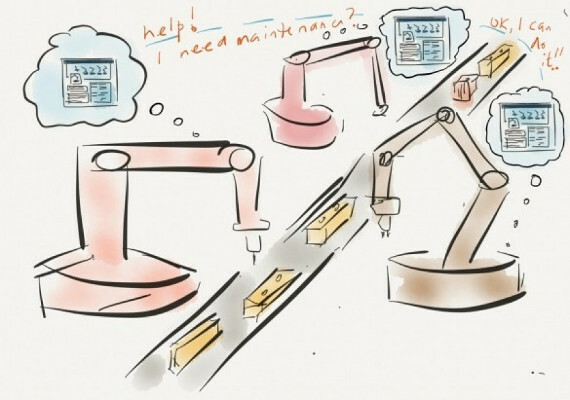 These days the Internet of Things and Industry 4.0 are words on every manufacturer’s lips. (In fact, the IfM’s Distributed Information and Automation Laboratory (DIAL), under the leadership of Professor Duncan McFarlane, has been at the forefront of research into this area for more than 15 years and pioneered the development of the Industrial Internet of Things.) Clearly, if a machine is connected to the internet you can get a vast amount of data out of it, you can analyse that data and you can optimise the machine’s performance. However, while the performance of each machine is important, in order to optimise the whole factory – or, indeed, the whole production network – it needs to be viewed in the context of the system. Having every machine performing optimally will not necessarily serve the system well. And while IoT holds out the promise of a solution, in practice it struggles to deliver. Individual machines are often maintained by their OEMs, which means there is no single view of how the factory operates, making it impossible to develop a truly integrated asset management strategy and system. This has been designed to help companies move from a cost-based to a value-based approach to asset management. It systematically determines how an asset contributes to the system’s value, how its condition can affect that value, and how the value can be managed by making the right decisions. The quality of asset management decisions rests on the quality of information available to decision-makers. Our information risk assessment tool helps infrastructure owners identify gaps in asset information and determine risks posed by poor-quality information to their business objectives. The tool helps companies to develop an effective business case for data and information quality improvement initiatives. Understanding the challenges in futureproofing assets and systems against disruptions over their long lifecycles is not straightforward. Our futureproofing tool helps decision-makers systematically assess and plan for the future needs of their assets. At the IfM we are extending the concept of IoT to develop the ‘social network of things’. If machines can report their ‘status’ into a common data-sharing platform – or social network – it becomes possible to create a single view of how the whole factory is running. To extend the social network analogy further, algorithms or ‘apps’ can be run on the social network platform which look at these updates and determine, say, the best maintenance plan for the factory as a whole. A conveyor belt, for example, might report that it is experiencing high levels of vibrations and that it will fail in five days’ time. With the right data links in place a ‘maintenance app’ knows that maintenance is scheduled for eight days’ time. The machine that is feeding products onto the conveyor can then calculate that if both the conveyor belt and the machine slow down, the life of the belt could be extended from five days to nine days. By slowing down the production line, it is possible to avoid either the conveyor belt failing in the middle of a production run or incurring the costs of expediting maintenance activities. Another example might be that a machine in Japan reports it has had a failure because of a part that was replaced recently. The same type of machine sitting in a UK factory can see this update, anticipate that it may suffer a similar failure and request a replacement. In these scenarios, it is the machines that are making the decisions. A human being looking at the same data – assuming they aways have access to it – would have to consider the same options and calculate the implications of each in terms of cost and productivity for the system as a whole. Machines can do this much faster and more accurately than we can. DIAL studies ways in which advanced information systems and automated identification technologies can be combined with advanced production and asset management systems to create and deploy smart products, reconfigurable manufacturing operations and innovative services. The Asset Management Group is part of DIAL. How do we operate, manage and maintain our assets to deliver best whole-life value? How do we futureproof our assets against changing requirements and against shocks? What decisions do we need to take to do so? What information do we need to make those decisions? The team is applying the same ‘social media of things’ approach to infrastructure. In that context, a bridge or tunnel could, for example, report that its lining is getting weak so that approaching trains slow down.